KANSAS CITY, Mo. (Feb. 12, 2017) – Traci Lynn Martin, an experienced expedition kayaker, will launch an attempt at a world record for the most miles kayaked in one year. She gets underway March 9, 2017. Martin was diagnosed with debilitating and painful rheumatoid arthritis in 2010. Despite suffering from this condition, she continues paddling and has won a wide range of competitions in several states, setting several course records in the process. She’s now taking her skill and strength to an ambitious next level, as she aims to paddle 8,600 miles in less than one year. Launching at Port Huron, Mich., Martin will circumnavigate the five Great Lakes, several rivers, and the Atlantic coast of the United States and Canada. Her goal is to finish the route in 265 days, with her finish ceremony at Lake Erie Metro Park, Michigan, in December 2017. Martin’s expedition is entitled “The Stellar Tour de Force,” and while she paddles, a filmmaking crew will document her efforts. The accompanying film, “Just Around the Pointe,” aims to capture the experiences, terrain, and people Martin meets along her journey. The expedition route traverses U.S. and Canadian shores, as well as five provinces and 14 states. In addition to the five Great Lakes, she will face wind, waves, and weather on the St. Lawrence River Seaway, the Hudson River, and on the Atlantic Ocean near Nova Scotia as she heads to New York Harbor. Martin’s return expedition travels along the Erie Canal to Lake Oneida, and back onto Lake Ontario via the Oneida and Oswego Rivers. Martin will be wearing a tracking device so friends, family, and fans may view her progress through RaceOwl.com. She also is inviting all local paddlers, and those who love the waterways she’ll explore, to join her as she negotiates the route. Traci Lynn Martin is a registered nurse who works at St. Luke’s Hospital in Kansas City, Mo. She is an avid outdoors enthusiast and experienced kayak racer who has won numerous races in several states. She was diagnosed with debilitating rheumatoid arthritis in 2010, but continued to paddle and race, setting several course records and earning many wins. She’s set her sights on completing a one-of-a-kind adventure, with the goal of paddling more miles in less time than anyone ever has; she’ll do it while reminding people who face chronic illness that nothing is impossible. Learn more about Martin’s competitive statistics, goals, and vision about her attempt at http://www.justaroundthepointe.com/meet-my-team. The current world record, held by Marcin Gienieczko of Poland, is 3,462.89 miles (5,573 kilometers). Unofficially, Freya Hoffmeister of Germany completed the longest solo kayak expedition to-date. She paddled 8,570 miles in about 360 days. Patty Dillon is the writer, producer, and director of the documentary film about Martin’s journey entitled, “Just Around the Pointe.” Dillon has extensive experience as a filmmaker and her work was featured on CNN, The Huffington Post, and elsewhere. She’s earned multiple award nominations for her documentaries. Dillon’s joined by her director of photography and co-producer, Jeremy Osbern. He has worked with some of the top names in the film business, including George Clooney, Lada Gaga, Jason Bateman, and Zach Galifianakis, just to name a few. Chris Blunk is the film’s senior producer, and his many film credits include “Jayhawkers,” a narrative feature about Wilt Chamberlain and Phog Allen; “The Sublime and Beautiful,” which premiered at Slamdance and which Candy Factory optioned for distribution. He’s also produced “AIR: The Musical,” which was distributed in North America, Australia, China, Taiwan, and South Africa. BLUE ISLAND, ILLINOIS, February 15, 2017 — Dragon Boat racing is back in Blue Island this summer, with a new, larger venue, more events, and some great additions like craft beer, food, merchandise, and more. The 2nd Annual Chicago Southland Dragon Boat Festival is scheduled for June 1-3, 2017, at the MWRD Waterfall Park along the Cal-Sag. This year’s festival also includes welcome receptions at Rock Island Public House and Double Play Saloon the evenings of June 1 and 2 after team practices, and an after-party June 3 at The Blue Island Beer Company. Brown says finding a new site was necessary to expand the event, and to better accommodate festival attendees with amenities like public transit access, abundant, free parking, and multiple food and drink options. Individual and team registration is underway at www.chicagodragonboats.com, as well as a description of available festival sponsorship opportunities – many of which include team entries for businesses and the community organization, school, or church of their selection. Description: The Chicago Southland Dragon Boat Festival caters to a variety of groups, including businesses, organizations, churches, families, competitive sports enthusiasts, and those who crave outdoor summer activity on a stunning dragon boat regatta course. Personal satisfaction, team development, and friendship are among the many benefits participants experience, and many companies, organizations, and schools have found that the social atmosphere and teambuilding aspects of dragon boat racing assist with ongoing constructive communication for their employees, members, and students. Thursday and Friday’s activities include team practice sessions with instructors from Great White North Dragon Boat Racing (GWN), as well as a team welcome reception at Rock Island Public House. GWN also provides the dragon boats, paddles, and life jackets for participants. Saturday’s activities include the dragon boat races, awards ceremony, craft beer village featuring the Southland’s best food and craft beer, and after party at the Blue Island Beer Company. For more information on the 2nd Annual Chicago Southland Dragon Boat Festival, to register as an individual or team, or to explore sponsorship opportunities, please visit www.chicagodragonboats.com. Wilderness Inquiry’s Canoemobile is coming to Northwest Indiana and Chicago next week! People of all abilities will have the opportunity to paddle in Voyageur canoes and experience the outdoors in a whole new way. These Canoemobile events are supported by our partners Toad&Co and the National Park Foundation. Read more here: https://goo.gl/fRG7kx. Canoemobile engages people in introductory outdoor experiences, enhances learning opportunities, cultivates a stewardship ethic, and creates pathways to pursue educational and career opportunities in the outdoors. Last year’s 30-city tour connected with over 12,000 participants. No motor boats, no barges, and deep enough not to scratch the bottom of your boat. Finally the secret of a beautiful flowing river in the southern suburbs of Chicago has been rediscovered. In the fall of 2015, the Cook County Forest Preserve opened a new boat ramp along the Little Calumet River at the Kickapoo Woods Forest Preserves. The immediate feedback from paddlers and novice alike was that it is a perfect venue. Kickapoo Woods offers plenty of parking in a safe, well-lit area for paddlers to enjoy. Not only does the new launch site offer easy, safe access to the river, but the location along the shallow portion of the Upper Little Calumet River makes it a perfect place for beginner and intermediate paddlers. Meander is the perfect verb and noun describing the paddling experience on this section of the river. The river bends and curves, and on most days, the river’s flow is calm enough to offer a gentle riding experience in the great outdoors. 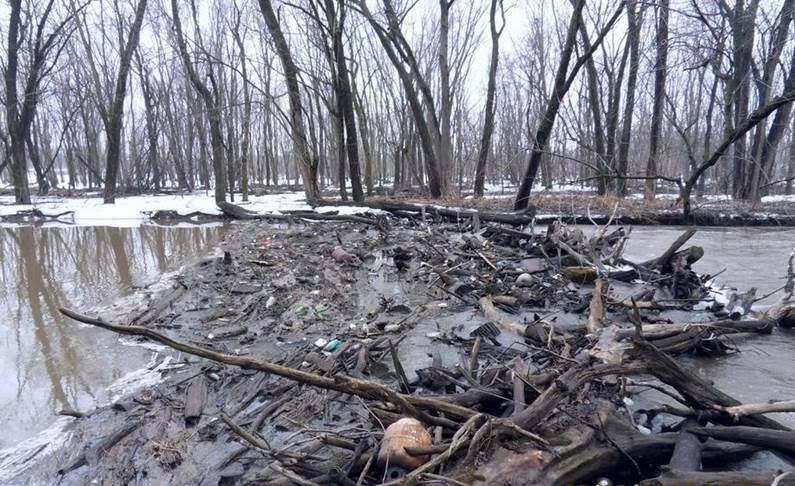 Join the coalition of outdoor enthusiasts and community organizations in not only a river clean up, but an introduction to both canoeing and kayaking on this gem in the southern suburbs. Saturday morning, June 4 2016, is the day of the “Little Calumet River Day at Kickapoo Woods;” please join us on exploring this secret south side treasure. 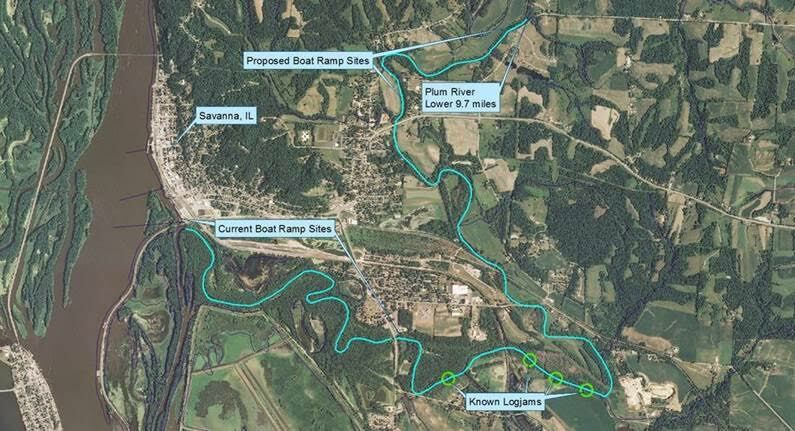 On July 29 and lasting until July 31st, the Plum River in Savanna, Illinois, will benefit from the efforts of individuals with the goals of making a navigable stream completely open for paddling, fishing, and wildlife interests, in short, creating a recreational destination for area residents and tourists. When completed, the Plum River will present 9.7 miles of paddling which uniquely requires only a two mile car shuttle. The stream is currently blocked by at least four known logjams. This problem will be addressed by a plan to manage timber stands along the river. The project combines three day community work and concurrent with one week AmeriCorps team work. The Lincoln Heritage Canoe Trail, our state’s first dedicated water trail, ran from near Decatur, to Lincoln’s New Salem State Historic Site on the Sangamon River. Governor Otto Kerner dedicated this Trail on Memorial Day Weekend 1965, with over 200 paddlers attending the original ceremony. 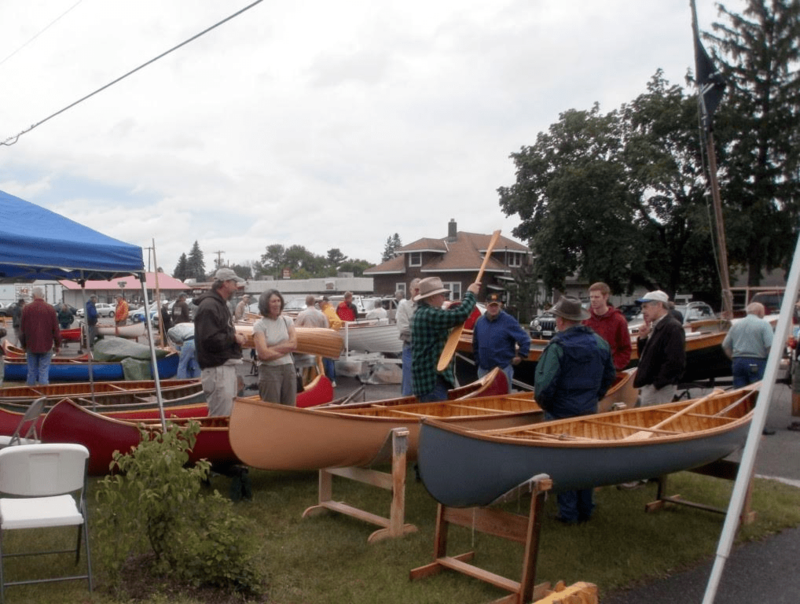 Notable guests included Gunner A. Peterson, Executive Director of the newly formed Open Lands Project, and Ralph Frese of the Chicagoland Canoe Base, who brought his 30 ft. “barker” canoes to the event. Over the 3-day weekend, the group paddled 66 river miles, camping in between. The Trail’s significance lies in its deep connection to Abraham Lincoln, who navigated the river first by dugout canoe, then by flatboat, eventually helping to pilot the first paddlewheel steamboat up the Sangamon. Due to a lack of available infrastructure for promotion and maintenance in 1965, the Trail was largely forgotten. In 2010, a group of like-minded individuals formed the Lincoln Heritage Water Trail Association (LHWTA) to promote, protect, and maintain the Trail. LHWTA will host two re-dedication ceremonies this year to commemorate the 50th anniversary of the original Lincoln Heritage Canoe Trail in 1965. The first event, Abe’s River Race, will be held May 23, and is a 12-mile race down the Sangamon from Irwin Road to Petersburg. Then a recreational paddle on October 3 will coincide with the candlelight tour at Lincoln’s New Salem Historic Site.